The Patagonia Sticky Rubber Ultralight Wading Boots are Ultra Light. Crazy, right?? They are also an extremely flexible, durable and stable boot for how light they are. If you find yourself hiking into the river a lot, doing lots of streamside trekking, or enjoy escaping the crowds by hiking a couple miles downriver before you even put your rod together, then this is the boot for you. Designed for the walk-in angler. 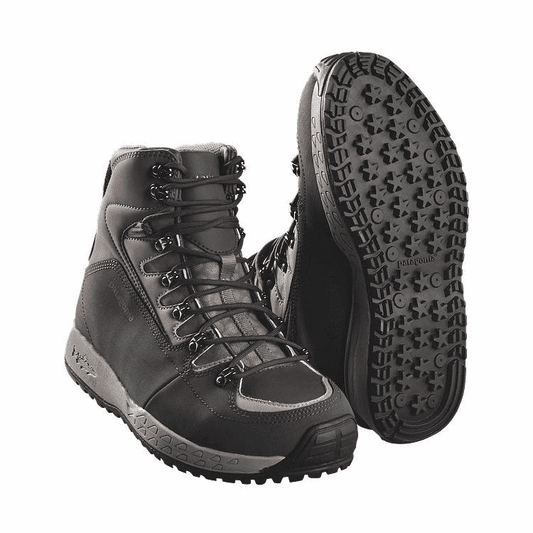 At 38 Ounces this boot feels great over long distances. It is super light and easy to hike and walk in. Sticky Rubber: A more environmentally friendly option and great grip. Although, we highly recommend screwing in studs to the rubber bottoms if you are wading in fast, turbulent rivers with varying sizes of rocks and substrate. Another great part about rubber soles is if you fish in snowy conditions, the snow doesn't stick to the bottom of your boot like it does to felt! Updated Material: New synthetic leather upper section dries quickly and adds a ton of durability to the boot. Monofilament mesh drains water from the boot but keeps sand and silt out for a more comfortable experience.